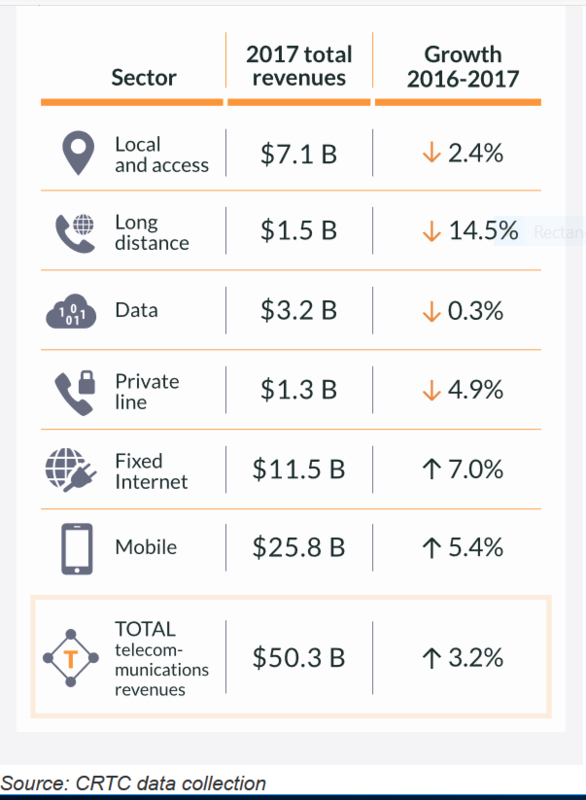 Total Canadian telecommunications revenues reached $50.3 billion in 2017, almost half of which was earned from mobile fees, according to new data released by the regulator. Grouping companies to include their affiliates, the five largest providers of telecommunications services accounted for 87% of total revenues in 2017. These company groups are Bell, Quebecor, Rogers, Shaw, and TELUS, and are a mix of incumbent TSPs and cable-based carriers – though all are facilities-based service providers. The percentage of revenues represented by the top five changes slightly from year to year as revenues grow, but more significant changes are usually due to larger factors such as occasional ownership transfers. One recent example is the BCE’s acquisition of MTS in 2017, which contributed to the growth of the revenue share of Canada’s largest providers. Generally, since 2013, the incumbent telecommunications service providers’ (TSPs) share of revenues has been declining by about one percentage point per year, to 59% in 2017. While the large incumbent TSPs represented only 1% of the number of telecommunications providers in 2017, they generated 58% of revenues. The cable-based carriers made up 8% of the total number of companies and generated 34% of revenues. With relatively low barriers to entry, especially in the long-distance sector, resellers comprised nearly 69% of service providers while making only 4% of revenues. The Telecommunications Overview provides a glimpse into various aspects of telecommunications in Canada. Section i: The competitive landscape offers a description of the entities supplying telecommunications services; Section ii: Telecommunications sectors provides revenue details for the six segments (local and access, long distance, data, private line, fixed Internet and mobile); Section iii: Financial performance reports various metrics such as capital expenditures and earnings before interest, taxes, depreciation and amortization; Section iv: Retail revenue growth sources provides insight into the sources of revenue growth; Section v: Consumer voices highlights customer contacts and Section vi: Sector summaries provides summaries of the six sectors, with longer-form descriptions available in subsequent sections of the 2018 Communications Monitoring Report (for retail fixed Internet and retail mobile). Unless otherwise noted, the first three sections deal with total revenues (retail plus wholesale), while Section vi: Sector summaries deals with retail revenues (except for the wholesale section).